Marquez Iron Works is Anaheim's best value for exceptional quality residential and commercial iron work design and installation services at affordable prices. Established in 2001, Marquez Iron Works is a family-owned and operated business which offers comprehensive iron work services to homeowners, business owners, industrial clients and construction industry professionals throughout Orange County. At Marquez Iron Works, we specialize in designing, crafting, and installing superior quality iron fences, gates, railings, window bars, security screen doors, and front entry doors for residential, commercial, and industrial clients at very competitive prices. In addition, we also offer a full service ornamental metal shop, and can manufacture structural steel and moment frames for new construction; design and craft such functional architectural features as metal staircases, pit and roof access ladders, metal bridges and gazebos; and also create decorative items such as metal wall sconces, furniture, and picture frames. At Marquez Iron Works, our expertly-crafted, precision-installed iron fences, gates, railings, window bars, security screens, and entry doors are constructed to last, and all of our ironwork is engineered and installed strictly in compliance with all applicable homeowners association CC&Rs and municipal building codes. Our skilled, experienced craftsmen perform all of their work to the highest professional standards, and produce fine quality iron work that is certain to add style, functionality, and value to your Anaheim residential, commercial, or industrial property. Choose the affordable experts at Marquez Iron Works. Call us today to schedule a free onsite design consultation and estimate in Anaheim. Our office hours are Monday through Friday, from 8:00am to 5:00pm. Marquez Iron Works is licensed, bonded and fully insured. 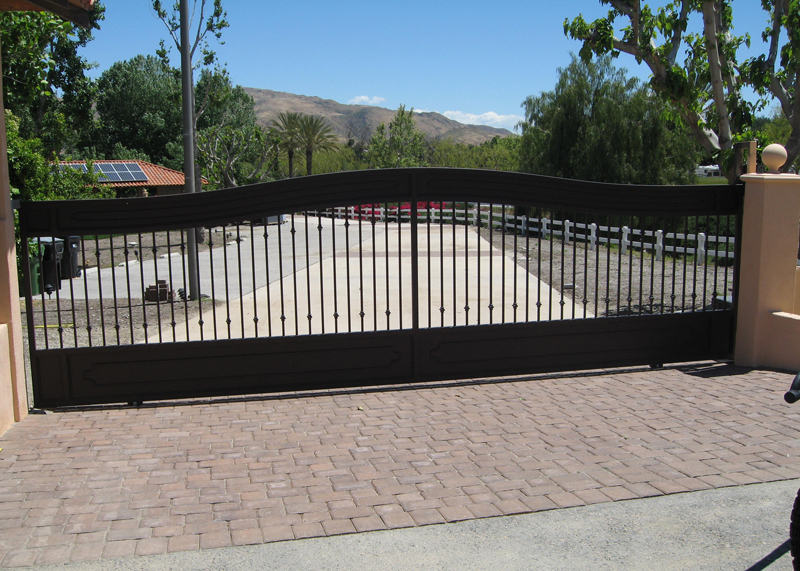 From simple entry gates to ornate, motorized access gates for homes, residential communities and commercial properties, at Marquez Iron Works, we can design, craft, and install any type of gate you desire for your Anaheim property. From strictly functional to highly decorative, our residential and commercial pedestrian entry and access gates are available in an endless selection of custom designs, and a wide range of iron types. Access control is the ultimate accessory for your entry or access gate, and provides additional security to your home or business property. And at Marquez Iron works, we sell and install all of the leading access control systems to Anaheim home and business owners. In addition, our knowledgeable ironwork professionals will be happy to train you on the programming and configuration of your new access control system, including how to add and delete users from the system, and how to integrate event logs which track who enters and exits your property. Choose Marquez Iron Works for full-service access control security system sales and installation. 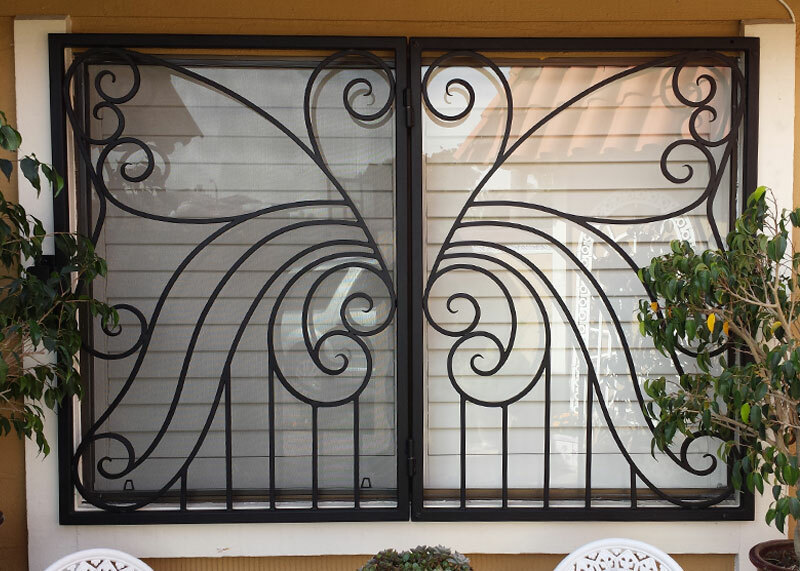 At Marquez Iron Works, we specialize in designing, precision-crafting, and expertly-installing exceptional quality iron fences, gates, railings, window bars, security screens, entry doors, structural steel, and moment frames, as well as in performing custom metal work projects of any size or scope in our full service custom metal shop, and offer these services to Anaheim homeowners, business owners, and construction industry professionals. We offer our iron work in a wide selection of metal types, including iron, steel, stainless steel, aluminum, cast iron, and wrought iron, and in both standard and custom-color powder coat finishes, to perfectly match your business's decor. Our exceptional quality iron work can be both galvanized or metalized upon request, and is offered with a two year warranty on materials, and a three year warranty on workmanship. Call us today, to schedule a free onsite design consultation and estimate at your Anaheim home or business. Marquez Iron Works is licensed, bonded and insured. Do you need a decorative or strictly functional stair rail, handrail or guardrail for your Anaheim home or business? At Marquez Iron Works, we can custom-design and install the perfect solution for your railing needs, no matter what size or type of railing you are looking for: from simple and functional to beautifully ornate. 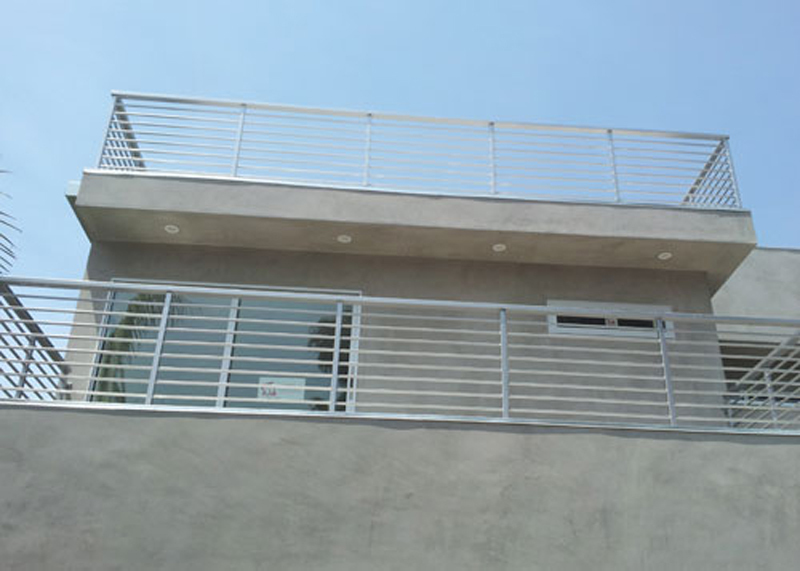 In addition, we also provide glass and cable railing. At Marquez Iron Works, customer service is extremely important to us, and from project start to completion, our skilled, experienced professionals will work closely with you to ensure that every stage of your railing project is finished to your complete satisfaction. Call us today for a free onsite estimate at your Anaheim home or business. At Marquez Iron Works, we are a full service ornamental iron contractor, and have a complete ornamental iron shop. 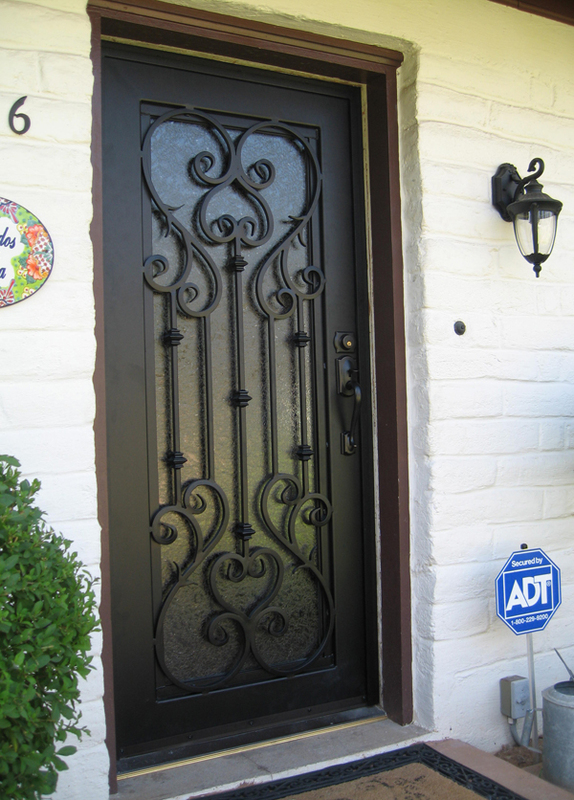 This facility enables us to custom design and craft all types of iron doors, and to offer them to our Anaheim clients at very reasonable prices. At Marquez Iron Works, we have been constructing and installing attractive, affordable iron fences for our Anaheim commercial and residential customers since 2001. We can craft and install decorative or functional iron perimeter fences to enclose and add charm to the appearance of your home or business, and can also install security fences to protect your home or business property from unwanted intruders. Our iron fences are perfect for yard, pet, and pool enclosures, and we also install property line fences which clearly define and enclose the perimeter of Anaheim commercial and residential properties. In addition, we feature security fences with both spear-topped and spike-topped pickets, to deter unwanted visitors. Call us today for a free design consultation and estimate. At Marquez Iron Works, we offer our custom metal work to Anaheim in a choice of metal types, including steel, iron, and stainless steel. In addition, our craftsmen can also work with brass, bronze, and copper. Our metal work is available in galvanized or metalized finishes, for maximum resistance against the elements, and can be powder coated in a choice of custom colors, to perfectly enhance the decor of your residential or commercial property. 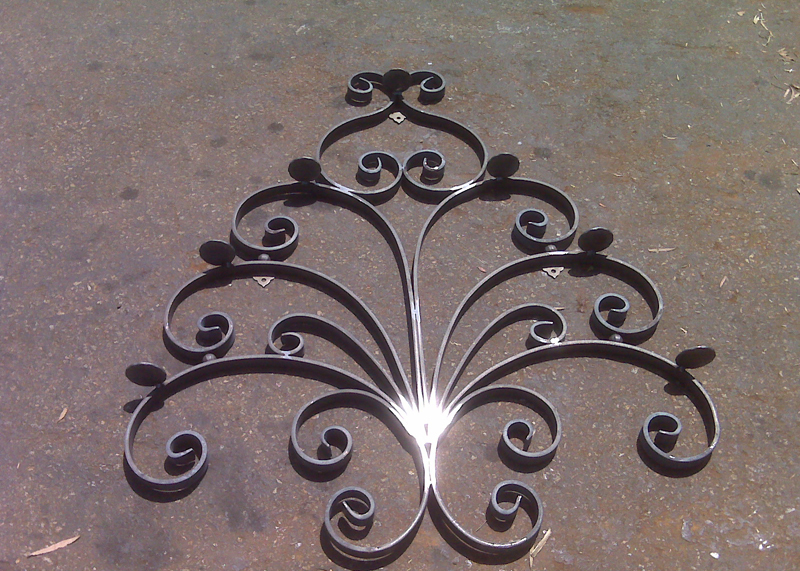 Call us today with any and all ideas you may have for custom metal work projects at your Anaheim home or business. Our skilled craftsmen look forward to the opportunity to turn your design visions into reality. At Marquez Iron Works, we offer free onsite design consultations and estimates, and are licensed, bonded and insured. Call us today. We offer free project estimates to Anaheim and all of Orange County. Security window guards and doors are an effective way to protect your Anaheim residential or commercial property from unwanted break-ins. Call us today to find out about the elegant, affordable security window bars and doors we offer. Your safety, and the safety of your employees, family and guests is extremely important to us, which is why all of our security doors and window guards are designed with the most up-to-date safety features available in the industry today. Call us to find out about how stylish and reasonably priced providing enhanced security to your home or place of business can be. Marquez Iron Works is licensed, bonded, and fully insured. Call us today, and learn about how the experienced iron work professionals at Marquez Iron Works can provide your Anaheim home or business with top quality iron work at affordable prices. We look forward to your call. 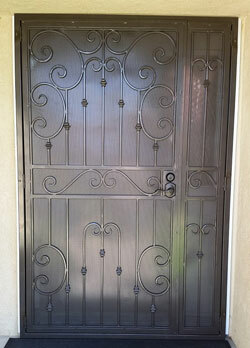 This wrought iron security door features a Tuscan ornamental accent and is constructed of durable steel tubing. We installed this security screen in Anaheim, CA.